TWO recent studies have clinched enough empirical data to repudiate any climate change sceptic. For the first time, the studies have pinned down greenhouse gas (GHG) emissions for frequent extreme weather events like rainfall and floods. In one study, UK and Switzerland researchers analysed one of the worst floods in Europe to understand if GHG emissions triggered the disaster. The floods in October 2000 in the UK had damaged properties worth US $2.1 billion. The researchers, led by Myles Allen at University of Oxford, asked volunteers to create thousands of probable weather conditions for that year simulating scenarios with GHG emissions and where no GHG was emitted in the 20th century. They used the results to estimate river runoff under different conditions. GHG emissions increased the risk of floods by over 20 per cent, they noted in the February 17 issue of Nature. In another study published in the same issue of Nature, researchers from Canada and the UK concluded that GHG emissions are responsible for the frequent heavy downpours in the Northern Hemisphere in recent decades. The team, led by Gabriele Hegerl of University of Edinburgh in the UK, analysed five decades of rainfall events. They collected daily rainfall data between 1951 and 1999 from 6,000 stations across the Northern Hemisphere and prepared a model that simulated weather conditions influenced by GHG emissions. They found that GHG emissions were responsible for the intense rainfall in two-thirds of the region. The intensification was more consistent in North America than in Eurasia because of lack of quality data, they said. They also analysed eight existing weather models used to predict extreme events and said their forecast may not be accurate. 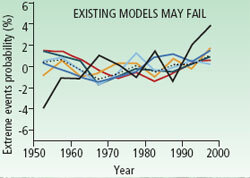 The models are underestimating the observed increase in heavy rainfall caused by global warming (see ‘Existing models may fail’), they noted. The researchers are, however, reticent about linking their findings to extreme weather events in general. Francis Zwiers, one of the authors from Canada’s Department of Environment, said it requires more research to establish that human activities are actually responsible for frequent extreme weather events across the globe. For example, concurrent severe floods in Australia, Brazil and Sri Lanka early this year were because of the cooling of the equatorial Pacific Ocean. Global warming could have compounded the effect. But this is difficult to prove, Zwiers added. Seung-Ki Min, another author, said it is difficult to detect the influence of GHG emissions produced by human activities in monsoon regions like India with strong natural variability in precipitation. “Extreme events are local in nature. So we cannot borrow results from other areas,” said Prashant Goswami, scientist at the Centre for Mathematical Modelling and Computer Simulation in Bengaluru. Weather models used for forecasting are based on grids. Smaller the grid, more the events it would capture. The grids have to be very small to capture localised events, Goswami added. M Rajeevan of the National Atmospheric Research Laboratory in Andhra Pradesh said the studies are significant as they relate the observed increase in extreme events to rise in sea-surface temperatures, which is attributed to human activities. “One of the problems that people have with climate change is it is a victimless crime. The impact is hypothetical; nobody gets affected by small rise in temperature,” said Allen. The studies offer a scientific base to differentiate between climate change-induced extreme events and bad weather. This will help quantify the impact of climate change on people. There is already money on the table at intergovernmental negotiations for climate change adaptation, Allen added.